Vellore is one of the largest districts in Tamil Nadu and is famous amongst tourists for its historical monuments and ancient sites. Hence, it has a significant place in the Indian history. With its history dating back to the period of the Chola dynasty, it is one of the oldest living cities in South India. Today, Vellore is frequented by tourists from all over the state on account of the presence of Vellore Fort, which is also known as the site where the Sepoy Mutiny of 1806 took place, and several age-old temples, which are considered as sacred sites amongst Hindus. How about exploring its divine temples this season? Following is the list of temples in Vellore which are epitomes of divinity and serenity and hence, should be ignored by any tourist or traveller. 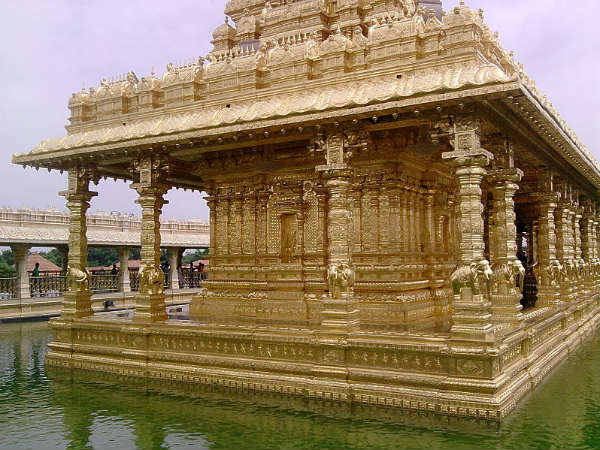 So, read on to know more about these holy temples. Located at Malaikodi in the midst of lush green hills at a distance of about 8 km from the centre of Vellore, Golden Temple is one of the most popular temples in the state. On an average, it is frequented by thousands of tourists every year. Even though the exact date and formation of the temple site is still unknown, the current building of the temple was inaugurated in the year 2007. It is entirely covered with thin gold leaves which weigh about 1500 kg. Isn't it a huge amount? Therefore, the temple looks like a glittering monument radiating brilliance. After all, the temple is dedicated to Goddess Lakshmi. You must visit this unusual temple which is a wonder in itself, while in and around Vellore. Dedicated to Lord Shiva, Jalantheeswarar Temple is located in a small hamlet named Thakkolam at a distance of about 75 km from the main city of Vellore and is one of the oldest temples in the region. The history of this ancient marvel dates back to the period of the Pallava dynasty in between the 3rd and 8th centuries. Therefore, the temple is not only a monument of religious significance but also a site of historical importance. The temple is built in Dravidian architecture and is visited by thousands of locals and seasonal tourists every year. Here, Lord Shiva is worshipped in the form of a lingam. Wouldn't you love to get yourself to this age-old beauty and explore its history? Another temple dedicated to Lord Shiva, Vilwanatheswarar Temple is situated at Thiruvalam in the Vellore district of Tamil Nadu. As per local legends, the temple is believed to be the site where Lord Shiva sent Nandi to help a priest and save him from the atrocity of a demon named Kanja. Today, the temple holds an important place amongst Hindus and hence, it is one of the most visited Shiva temples in the state. It was constructed during the reign of the Chola dynasty around the 10th century. However, no strong evidence to prove its exact time of formation has been found. Like Jalantheeswarar Temple, it is also built in Dravidian architecture. The pristine surroundings of the temple will certainly help you feel divinity. Also known as Yoga Narasimha Swamy Temple, Sholingapuram Temple is located atop a rocky hill in a village named Sholinghur, which is nestled at a distance of about 50 km from the main city of Vellore. The temple is dedicated to Lord Vishnu and dates back to time unknown. It is also one of the 108 major Vishnu temples in the country, which are collectively known as Divyadesams. Therefore, it is considered as one of the significant religious sites amongst Hindus. It is also said that whoever has visited this temple which utmost devotion, has always returned with the boon of a blissful life. You can also find the shrines of Lord Narasimha and Lord Hanuman in the temple complex. Ratnagiri Murugan Temple was built in the 14th century as a sand structure. However, today, it is standing atop a hill as a stone temple and is visited by tourists and Hindu devotees from all over the state. Clear from the name, the temple is dedicated to Lord Murugan, the god of war. The major reason why you must visit this ancient temple lies in its divine atmosphere and peaceful ambience. Wouldn't you love to laze by a serene spot and get lost in the beauty of divinity? If yes, then this centuries-old temple should be your next stoppage.